(Newser) – Libyan rebels appear to have "summarily executed at least 66 captured" fighters loyal to Moammar Gadhafi, and probably the dictator himself, when they overran his hometown a year ago, a human rights group said today. The report by Human Rights Watch on alleged rebel abuses that followed the October 2011 capture of the city of Sirte is one of the most detailed descriptions of what the group says were war crimes committed by the militias that toppled Gadhafi; the militias still play a major role in Libyan politics today. 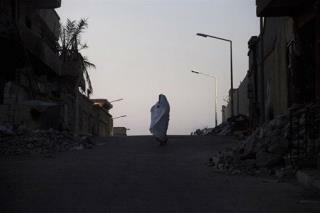 The report details the last hours of Gadhafi's life, when he tried to flee the besieged city. New evidence unearthed in its investigation includes a mobile phone video clip taken by militiamen showing many prisoners from Gadhafi's convoy being cursed and abused by rebels. Footage shows "Gadhafi was captured alive but bleeding heavily from a head wound," the report says. He was "severely beaten by opposition forces, stabbed with bayonet in his buttocks, causing more injuries, and bleeding." Once he's "loaded into an ambulance half-naked, he appears lifeless." The rights group's "findings call into question the assertion by Libyan authorities that Moammar Gadhafi was killed in crossfire and not after his capture," says a spokesman. Click through for the full story (warning: graphic images). This was a revolution, how is this new or strange? The same thing has been done a hundred times before...MORE! just the good old savage way of LIFE! they will never be anything else! get out now! FUBO! Ghadhafi set the standard for savagery in Libya, and spread it across the oceans. This requires a clear and complete investigation, a forensic investigation. If, in fact, crimes were committed those perpetrators should be apprehended and tried. If they are found guilty they should be sentenced according to the justice in play in the system in which s/he's tried. Personally, I think when the State can execute you, there's some question as to whether you're a "citizen" or a "subject," so I'm for setting the maximums at "Life UTTERLY Without (even the thought of) Parole," I'm for confining them, alive, for the rest of their natural lives, living in a cage as just a hint tossed in their direction of the magnitude of the offense they've committed. However, should they be convicted of crimes that call for the "max" penalty available, whatever the "max" is in the jurisdiction in which they are tried ... or maybe even according to the "max" in the jurisdiction where the crime(s) were committed, at the discretion of those against whom the crimes were committed ... so should they be sentenced.